Illinois Natural History Survey graduate researcher Benjamin Williams follows the activities of ducks migrating along the Wabash River in southeast Illinois. The birds, like this American green-winged teal, stop at wetlands and other habitats on their way to their summer nesting areas further north. ON THE WABASH RIVER, Ill. — I'm sitting in a camouflaged blind when the sun breaks the horizon and lights up the southeast Illinois wetland. Hidden by cattails and other vegetation, I watch my breath and note how cold my feet are despite the thick wool socks and insulated waders I’m wearing. Williams and his crew are studying the behavior of mallards, like this one, and American green-winged teal. 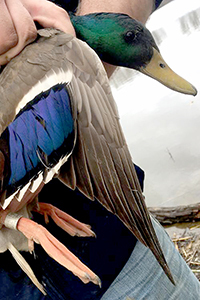 A hundred yards away, ducks – most of them mallards or American green-winged teal – begin to drop from the sky to land on the water along the shore, right near my bait. During their spring migration, the ducks stop in the Wabash River to rest and load up on available resources before their next push north. My heart beats faster when I see them swimming toward my “catch zone,” the area my net will cover once it is deployed. Once we catch them, our crew will examine the ducks and record data on each one. Each bird gets a metal leg band and radio transmitter with a unique frequency. Affixed with sutures, glue or wires, the transmitter fits like a backpack between the wings, allowing the duck to swim and fly normally. 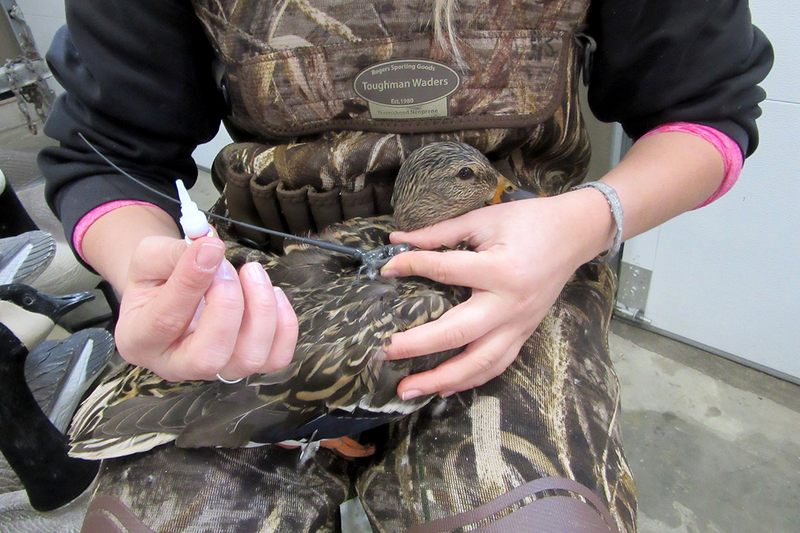 Radio-telemetry transmitters on the ducks’ backs allow scientists to follow individual birds. 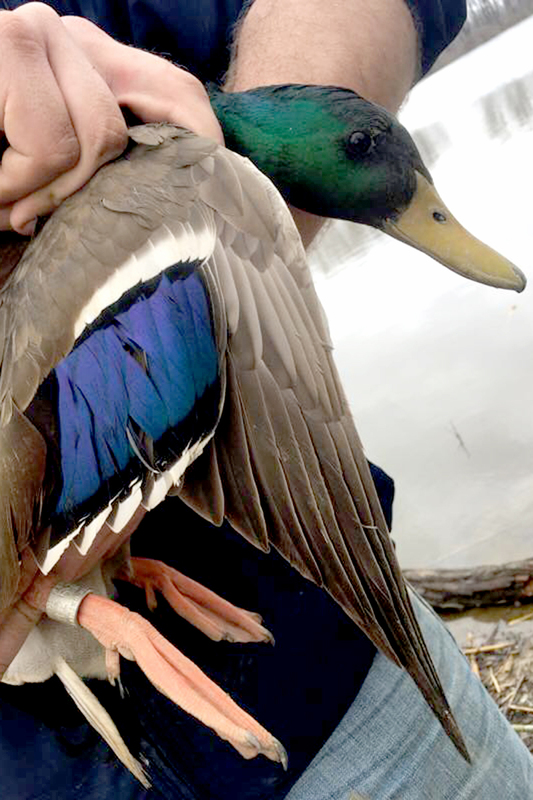 The transmitters do not interfere with a duck’s ability to fly, swim or forage. The marsh is alive now with ducks quacking, otters playing and songbirds singing all around me. I remain silent and still. 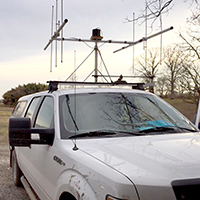 After we release the captured ducks, we will use the huge antennas and high-powered telemetry equipment on our truck to dial in each bird’s unique frequency, like a radio station, and track it and the others around the valley. Using telemetry to track the birds from different sites allows me to know exactly where each duck is sitting, what habitats it likes to use, and how long it stays in the region. 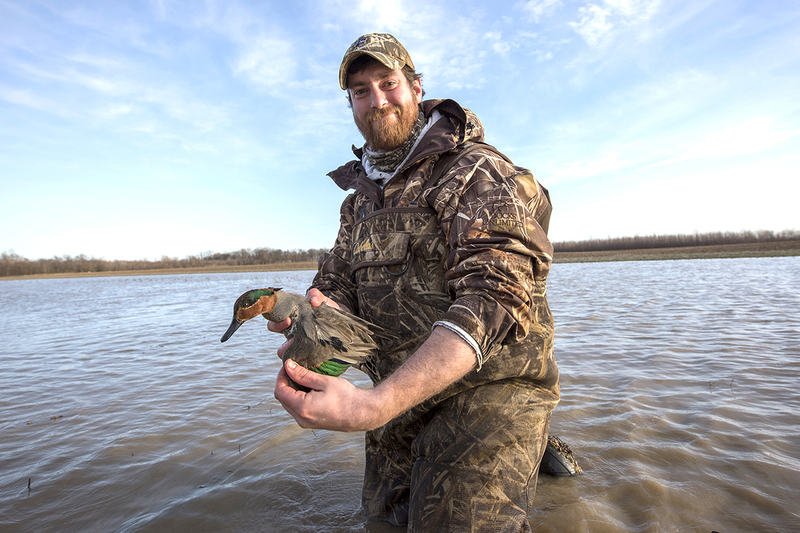 All of this data will help guide future management decisions, and direct conservation funding to provide adequate resources for all of the waterfowl stopping in the Wabash Valley each spring. 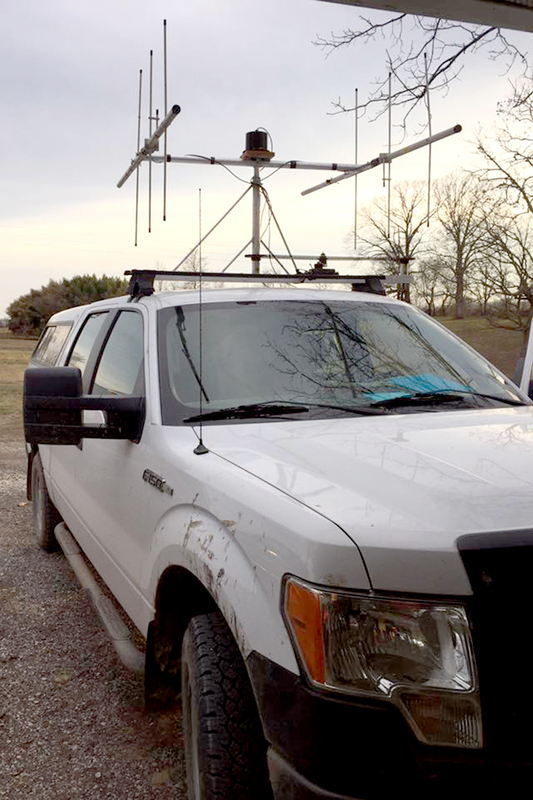 Receiver antennas on a truck allow the researchers to pinpoint the location of individual birds. I hit the detonator, igniting the charges and launching the rockets that carry my net into the air. With a loud “Bang!” the net flies up and over the ducks before they can get away. I jump out of the blind and begin running toward the net. Ducks splashing under the net signals success. Now the real work begins.